J.K. Rowling is a British novelist and best known as the author of the Harry Potter fantasy series. The Harry Potter books have gained worldwide attention, won many international awards, and sold more than four hundred million copies. J.K. Rowling is the United Kingdom's best-selling author since records began, with sales in excess of £238m. 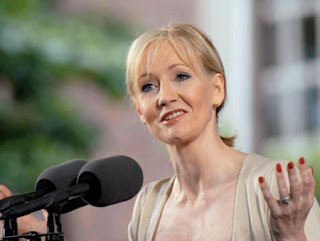 J.K. Rowling was Born in Yate, Gloucestershire on 31st July 1965. Let's remember J.K. Rowling's birthday with Top Ten Famous J.K. Rowling Quotes. I would like to be remembered as someone who did the best she could with the talent she had. Harry Potter gave me back self respect. Harry gave me a job to do that I loved more than anything else. The most important thing is to read as much as you can, like I did. It will give you an understanding of what makes good writing and it will enlarge your vocabulary. I think you're working and learning until you die. Honestly, I think we should be delighted people still want to read, be it on a Kindle or a Nook or whatever the latest device is. It is impossible to live without failing at something, unless you live so cautiously that you might has well not have lived at all, in which case you have failed by default. Never be ashamed! There's some who'll hold it against you, but they're not worth bothering with.